Food: Chicken *-* You can't say no to chicken! Food: Sushi. I don't know if it's considered as food, but I don't like dressing ._. 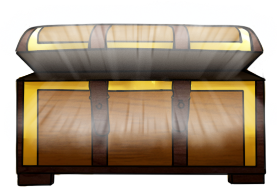 I'm going to post what I get from Treasure Hunt, Mystery Boxes, etc. Basically a log on what I get from different stuff. I stopped keeping track of what I got. Still haven't kept track, but we'll see what the future will bring. Time to set new goals! I was supposed to make a post about this three days ago, but I forgot ._." Anyway. About a week ago, I got part 2 of The contest of the Profs. I succeded on beating Prof. Oak and received a retro egg. Tbh, I didn't really think about what it could be. Suddenly, I got a notification that I hatched a shiny pokémon O_O I thought I finally hatched my shiny Space Spinda, but I was wrong. I checked my party and found this guy! I have no plans to leave this site, so I'm looking forward to the next year and maybe the year after that, and the year after that, and the year after that ... until infinity! This is my first time participating in the Shaymin event! I finally got 2x Shaymin, 1x Garcidea and 1x Shaymin plushie. I caught a wild shiny TheInsaneTeddy! She's my first shiny on the honeytree. Quote from Honeytree Look! A wild Teddiursa ( ￼) ( SHINY) is eating your honey! Quote from Prof. Rowan ﻿ Happy Birthday, Maniac! Congratulations, Maniac! Your Kanto-Dex is now complete! Wow, really can't believe it... you achieved this huge goal and helped me so much with my research! I still remember the day when I gave you your Starter-Pokémon, Tepig. Well, time flies by... I'm already getting a bit sentimental. Please take this certificate - it is a proof for filling the Kanto-Dex. Nevertheless, I have something else to talk about with you. I found this mysterious coloured egg recently on a Rumble Mission and I tried hard to hatch it, but with no success at all. I'm not sure if one could even hatch it - and if it even contains a Pokémon. But... the mystery behind it is fascinating me and I really want to uncover it. Do you think you can hatch it? Congratulations, Maniac! Your Johto-Dex is now complete! Please take this certificate - it is a proof for filling the Johto-Dex. Quote from Task What was the best gift you ever received? Share a feed with the hashtag #MyBestGiftEver and Tell the world about that one thing that made you very happy! Quote from Task Event Egg Obtained! Take good care of it. Quote from Todays challenge Send 2 Dream World Plushies (Min. : 10DP) to another user. Quote from Todays challenge 20x Dream Points obtained! Quote from Todays challenge Hatch 3 eggs. Quote from Todays challenge 10x Flying Gem obtained! Quote from Todays challenge Set up one Wonder Trade at the GTS. Quote from Todays challenge 1x Mystery Box (Light Blue) obtained! Quote from Todays challenge Flip the coin 50 times (Game Center). Quote from Todays challenge 3x Ultra Ball obtained! Quote from Todays challenge Make 750 interactions. Quote from Todays challenge Event Egg obtained! Take good care of it. Quote from Todays challenge Brrr, it's cold... Fill your Party with 4 Fire Pokemon! Quote from Todays challenge 20x Chesto Berry obtained! Quote from Todays challenges Do you have a Pokemon that you don't need? Set it up at the Auction House! Is there a Pokemon that you still need? Bid on an Auction! Quote from Todays challenge 1x Event Plushie obtained! Quote from Todays challenge Buy 10 Lottery Tickets. Good luck! Quote from Todays challenge 200x GC obtained! Quote from Todays challenge Send at least 1 christmas gift to a friend (see news post for more information). Quote from Todays challenge Christmas Gift recieved! Quote from Todays challenge Summon the snow in Emera town! Place 5 Ice-Pokemon in your party. Quote from Todays challenge 15x Lum Berry obtained! Quote from Challenge 1/2 Send out at least one christmas gift. Quote from Challenge 2/2 Make 400 interactions. Quote from Challenge 1x Even Voucher (Uncommon) obtained! Use it at the Event Shop to get one free Event Egg (Uncommon). Quote from Todays challenge Share a feed with the hashtag #MyWishForChristmas! Quote from Todays challenge 1x Mystery Box (Dark Blue) obtained! Quote from Advent Calendar Free Friday! Quote from Advent Calendar 5x Poké Ball obtained! Quote from Todays challenge 1x Christmas Skiddo Plushie obtained! Quote from Todays challenge Set up a Wonder Trade! Quote from Todays challenge 1x Razor Fang obtained! Quote from Challenge #1/2 Set up an auction at the Auction House. Quote from Challenge 2/2 Did you find any auction that you're interested in? Bid on at least 3 auctions! Quote from Challenge 1x Mystery Box (Light Blue) obtained! Quote from Todays challenge Make 300 interactions. Quote from Todays challenge Mysterious Egg obtained! I got a Santa Bird! Quote from Challenge #1/3 Christmas is near - don't forget to send out 2 christmas gifts! Quote from Challenge #2/3 There are many eggs freezing! Time to interact. 100 interactions. Quote from Challenge #3/3 Last but not least: Time to chill at the Game Center. 20 coinflips. Quote from Challenge 1x DNA Splicer (Black) obtained! Quote from Todays challenge It's time for a Pokemon Christmas Party! Invited guests: Spheal, Delibird and Vanillite! 3 in your Party. Quote from Todays challenge 1x Polestar Plushie obtained! Quote from Todays challenge 10x Fighting Gem obtained! Quote from Challenge 2/4 Hatch 4 eggs. Quote from Challenge 3/4 Secret Santa! Set up a wondertrade. Quote from Challenge 4/4 Smile and be happy! Quote from Challenge You received a premium upgrade (1 week)! Merry Christmas! 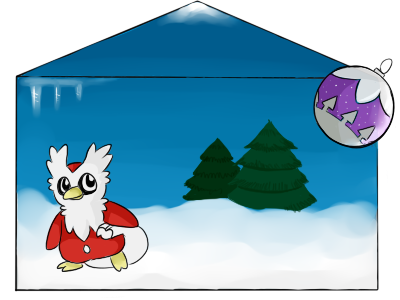 Quote from Advent calendar Open at least 20 doors until Christmas and receive a very special new Pokémon! Quote from Advent calendar You have opened enough doors to claim our special reward! Quote from Advent calendar Take good care of it, it is a very special egg! Note: This Pokémon evolves differently depending on whether it's day or night. Quote from PokéRadar Congratulations! A shiny Space Spinda hatched out of one of your eggs (Chain #243)! Your PokéRadar reset and needs new batteries. Congratulations, Maniac! Your Hoenn-Dex is now complete! Please take this certificate - it is a proof for filling the Hoenn-Dex. Congratulations, Maniac! Your Sinnoh-Dex is now complete! Please take this certificate - it is a proof for filling the Sinnoh-Dex. Congratulations, Maniac! Your Unova-Dex is now complete! Congratulations, Maniac! Your Kalos-Dex is now complete! Please take this certificate - it is a proof for filling the Kalos-Dex. I'm so happy, and I can't thank you enough! After being on PH for over 1 year - I finally purchased premium. It's my first time buying premium (all the other times I had premium was from special events). Valentine's day, eh? ¯\_(ツ)_/¯ And also; last post of this page!